Outline drawing of Crammage Head sites. Sketch plan of Crammage Head dun. 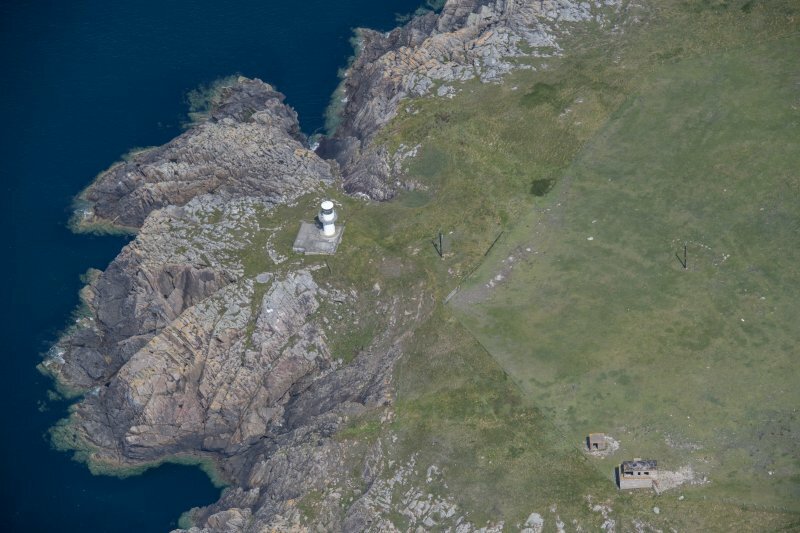 Classified as a promontory fort in 1912, it is suggested in 1963 that the structure on Crammag Head is most probably a broch. Since 1912, a lighthouse and other buildings have been built on the site, but they do not affect the ditch and outer bank which are still as shown on plan, but the E part of the stone structure, which was 60' in overall diameter, has been destroyed by the construction of a water tank and storehouses. The surviving masonry is very large and broch-like, but the wall thickness cannot be precisely determined as the inner face is nowhere visible; it seems possible that it was some 15' thick all round. On the NE some facing stones have fallen outwards. On the W side, the surviving outer face stands 5' - 6' below the centre of the enclosures; the foundations of the inner face were presumably at a higher level and have been removed. These remains are generally as described although the plan of 1912 is more suggestive of a dun than a broch. 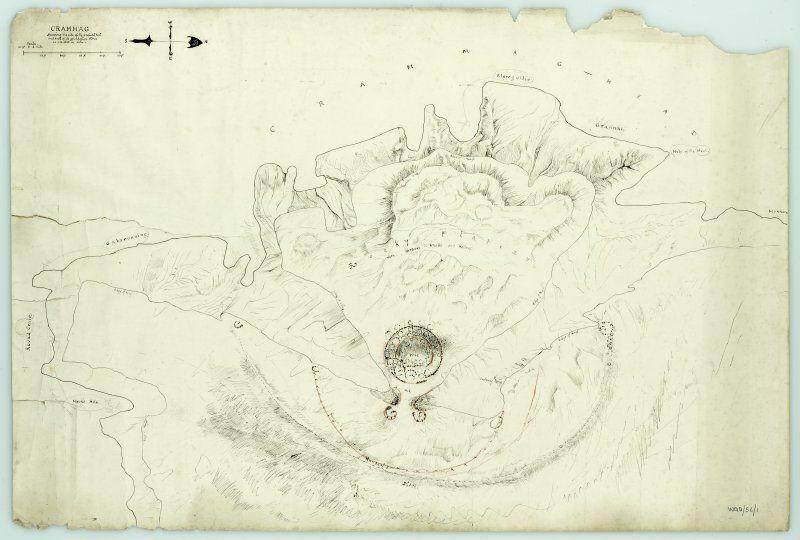 An accurate classification of the surviving remains, a stretch of large squared grounders, is not possible. The ditch and outer bank may be the remains of an earlier work, but this can only be determined by excavation. The name "Crammag Fort" is not known locally. Vitrified material was found at one point in the outer rampart, and among the small stones scattered on the slope below the rampart. There is also a spring within the area enclosed. 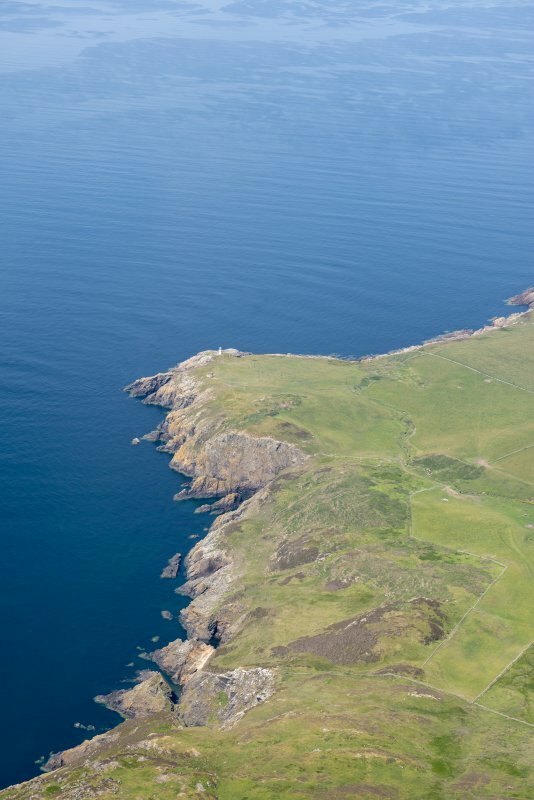 The remains of what is probably a dun or broch with outworks are situated on Crammag Head. 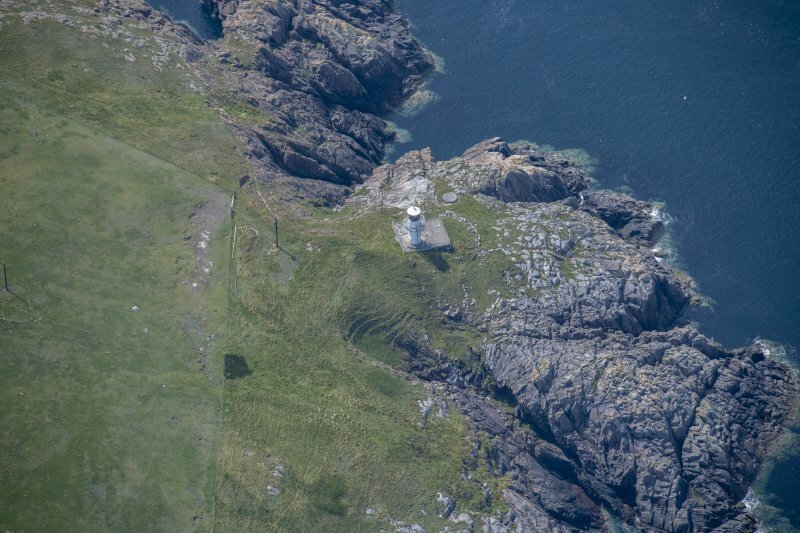 The dun measures about 19.5m in diameter over all but its wall has been reduced to little more than the basal course of the outer face around the W, and a thin scatter of debris on the E; the granite facing-stones measure up to 1m in length by 0.65m in breadth and 0.65m in height, and a maximum of three courses is visible on the NW. None of the inner wall-face survives but, on the W, the interior, which is now occupied by Crammag Head Light, has been raised up to 1.8m above the outer face with material from a ditch immediately E of the dun. The ditch is broken by a causeway 2.5m wide which is faced with granite boulders along its S side; to the N of the causeway the ditch measures 9m in breadth and varies from 1.3m in depth externally to 2m internally, but to the S it is only 6.5m in breadth and 1.1m in depth. About 20m E of the ditch there is an outer rampart with external ditch; at its N end the rampart has been reduced to little more than a scatter of stones but towards the S it is up to 4.4m thick and 0.5m high. The ditch is only visible at the S end of the rampart and measures up to 5.5m in breadth by 0.3m in depth. The entrance through the outer defence was probably at its S end where the rampart and ditch stop 3m and 5m short of the edge of the promontory respectively. 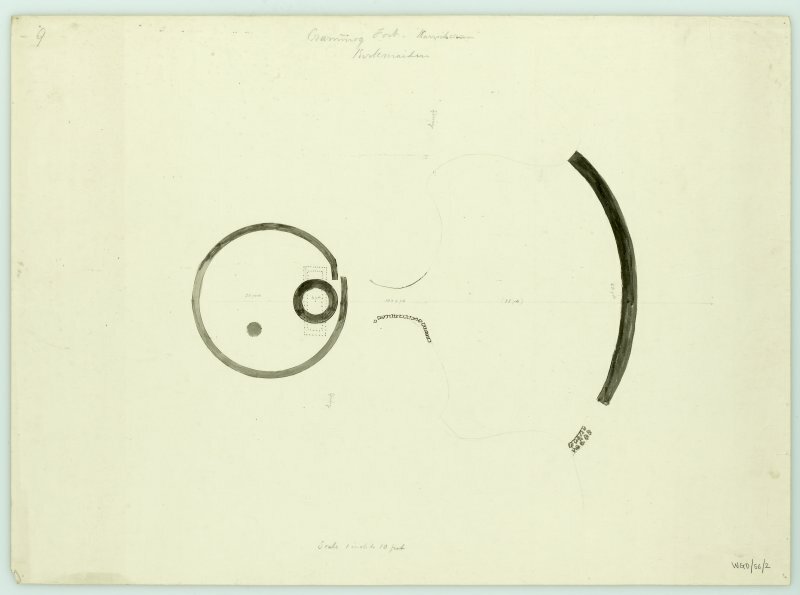 Earlier descriptions and plans of the site made before the construction of the light beacon (WGD/56/1, SAS 454) show that the dun was roughly circular with an entrance passage on the E, where the wall was at least 4.5m (and possibly as much as 6m) in thickness. In the 19th century 'vitrified' stone was recovered from the outer rampart. Name Book 1848; W Todd 1854; G Wilson 1885; RCAHMS Survey of Marginal Lands; R W Feachem 1977; RCAHMS 1985, visited (SH) July 1984. Since the Inventory description was written, a lighthouse and its appurtences have been built on the site in spite of the fact that the fort was included in the list of monuments deemed most worthy of preservation. The ditch and outer bank are still unaffected , but the E half of the stone structure has been destroyed by the construction of the water tank and storehouses. The masonry is very large and broch-like, but the thickness of the wall cannot be precisely determined since the inner face is nowhere visible. On the W half the surviving outer face stands 5-6 ft below the centre of the enclosure; the foundations of the inner face were presumably at a higher level and have now been removed. It seems possible that the wall was about 15 ft thick all round (the so-called overlap on the NE does not exist: all that has happened is that some facing stones have fallen outwards) and I would not dismiss the possibility that the structure is a broch. Excavation is still possible in the W half of the walled enclosure and it would be valuable to obtain the thickness of the wall here. Visited by RCAHMS 25 September 1953. This promontory fort containing a probable broch in Kirkmaiden was originally diagnosed as such in 1912 , and the identification of the circular structure as a broch was confirmed in 1963 . However it is impossible now to measure the circular building, which was partly destroyed by the construction of a lighthouse on the site after the Royal Commission’s visit. 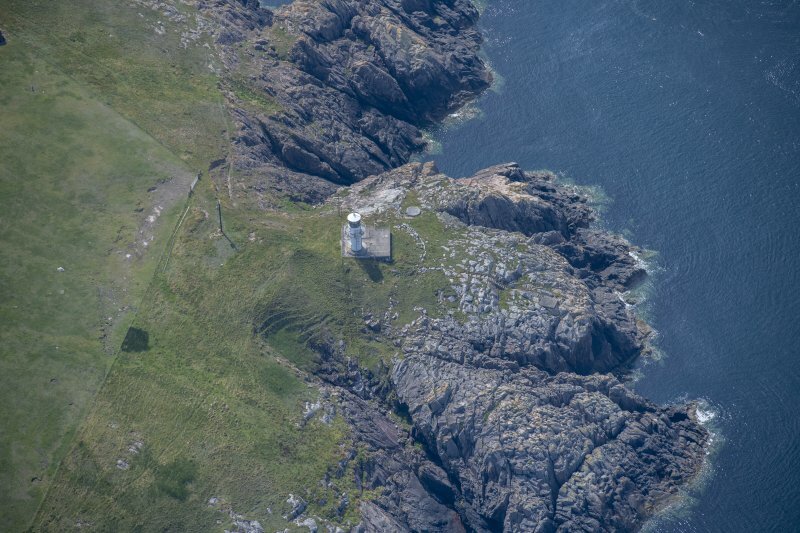 Nevertheless the surviving masonry is “very large and broch-like”  and an overall diameter of 18.3m (60 ft) was measurable before the lighthouse was built . Sources: 1. NMRS site no. NX 03 SE 1: 2. RCAHMS 1912, 54-5, no. 143 with plan: 3. Feachem 1963, 174. NX 0891 3404 A watching brief was undertaken on 8–9 October 2009 during ground-breaking works associated with the installation of new services. 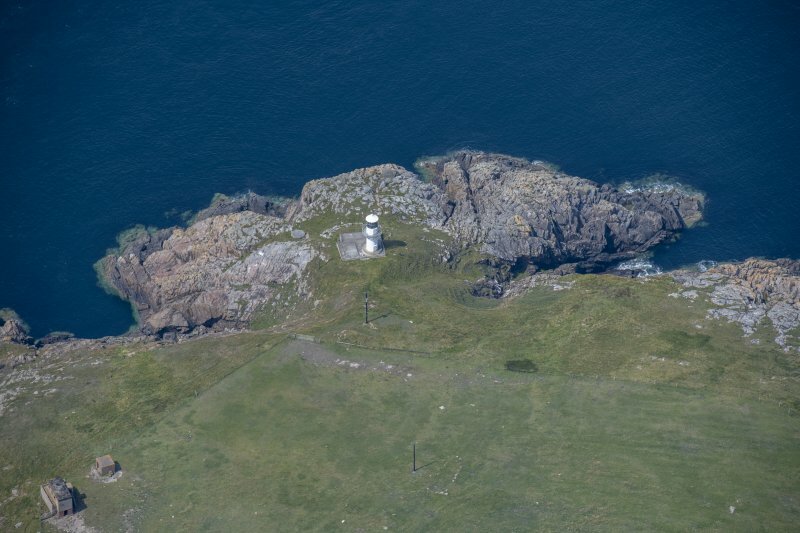 The work related to the construction of a new lighthouse within the confines of a dun, which is a scheduled ancient monument. No deposits, features or finds of archaeological significance were found. 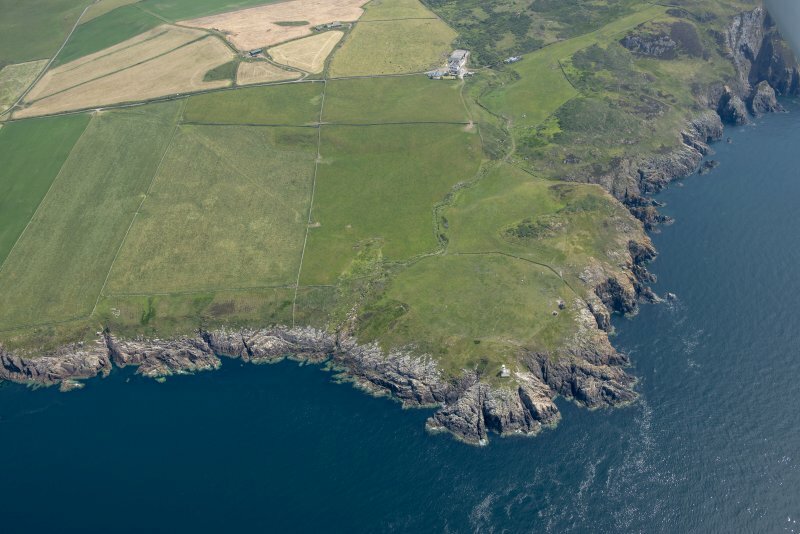 This promontory fort occupies Crammag Head, a bare rocky headland crowned by a small lighthouse on the W coast of the Rhinns of Galloway. Its defences comprise a single rampart with an external ditch, which cut off the landward approach from the E. The rampart has been heavily damaged and at its N end has been reduced to little more than a scatter of stones, but towards the S it increases to a maximum of 4.4m in thickness by 0.5m in height, and the accompanying ditch is 5.5m in breadth by 0.3m in depth; a gap between their southern terminals and the edge of the promontory probably marks the position of the entrance. The extent of the interior is difficult to determine, extending to a maximum of 0.6ha where the bare rock steps down to the sea on the W. The occupiable area, however, would have been considerably smaller and perhaps as little as 0.2ha, representing the current extent of continuous grass cover on the top of the promontory, which was formerly occupied by a broch or dun, though this was partly demolished about 1913 when the lighthouse was erected. The broch or dun measured about 19.5m in overall diameter, and while little more than a scatter of stones remains of its wall on the E, the basal course of the outer face, comprising massive granite blocks up to 1m in length, can be traced around the W, and up to three courses are visible on the NW. 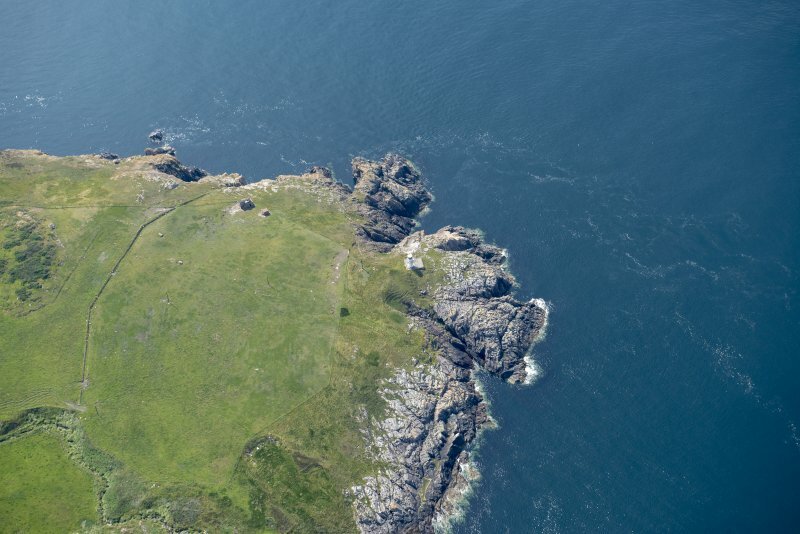 The broch or dun was positioned on the seaward side of a narrow neck formed by a precipitous crevice that runs into the headland from the NW some 20m behind the rampart of the fort. The crevice has been enhanced as a defensive outwork to the broch or dun, creating a broad ditch to either side of central causeway some 2.5m wide and faced on the S with granite boulders. On this side of the causeway the ditch is 6.5m in breadth by 1.1m in depth, but to the N its breadth increases to 9m and it is 1.3m in depth.